Section Chief Komba Sebba has not been in a good relationship with his elder brother, Aiah Sebba for over ten years. He accused Aiah of campaigning against him when he attempted to be elected section chief of Dumbia in Fiama chiefdom, Kono district. When Komba won, Aiah declared that he would never work with his brother as long as he stays as section chief. Due to this, some traditional leaders intervened but it was a fruitless endeavor as the situation between the two siblings deepened. The whole section suffered either directly or indirectly as Aiah is also an influential person in that community. 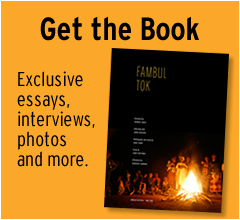 During Fambul Tok bonfire night in Yikior village on February 20, 2014, Komba, a member of the Reconciliation Committee came out and testified that he had wronged his elder brother and they have not been on speaking terms for over ten years. He told the gathering that he, as a member of the committee, thought it fitting to apologize for all that he has done. Accepting his apology, Aiah said he had problems with Komba over chieftaincy, adding that he did campaign against him to lose the election. He also told the gathering that Komba failed to hand over some items he gave him for safe keeping during the war. The Reconciliation and Outreach community members joined Komba to apologize to Aiah amidst singing and dancing. They hugged each other and sobbed for a few minutes. 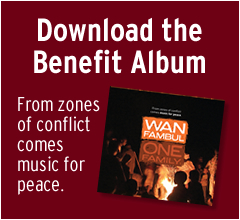 There was much jubilation in the entire community upon seeing the once divided brothers embracing each other. 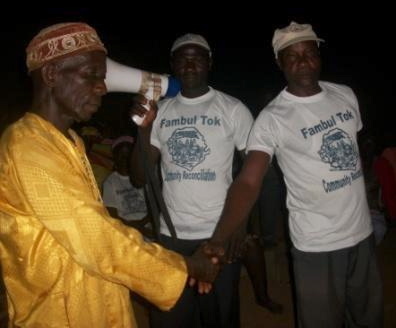 This entry was posted in From the Ground: Program Updates from Sierra Leone, Kono District, Wan Fambul/One Family and tagged bonfire, ceremonies, Fambul Tok, Kono, Reconciliation Committee. Bookmark the permalink.